The upper beak of a psittacine is made up of a couple of bones that are attached to a hinge to the bones of the braincase and the horny tissue over it. Unlike the upper jaw of mammals, a parrot's upper beak is flexible and capable of some movement. The beak "bones" are covered by a horny sheath. Like our fingernails, the beak is composed of live tissue and continually grows. It grows lengthwise, as well as outward. The most superficial surface is dead, keratinized tissue that flakes or chips off. Some superficial cracks on the outer layer of the beak appear in the process of beak renewal. This is completely normal. Recommended Action: Veterinary diagnosis and treatment. Quarantine sick birds and disinfect the premises. Meticulous sanitation has to be maintained especially until problem has been resolved. Provide best nutrition possible, meeting the species' nutritional requirements, to help support its immunesystem and maintain good health. Symptoms: Hyperplasia (proliferation of cells), cornification and keratinization of the cere (it may develop a "hornlike" appearance. It is displayed as a thickening to this area; brown in color. Possible Cause: Brown Hypertrophy: A condition most often seen in budgerigars, to a lesser exent in other psittacines. It can progress to close up the nostrils (nares) causing beak breathing. It is not critical unless it begins to block the nasal passage. Dietary: Poor feather condition / long molts and flaky beaks suggests the bird's diet is deficient in the limiting amino acid methionine. 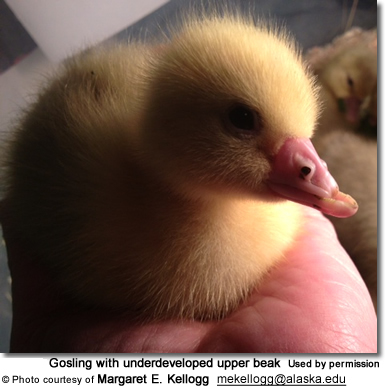 Once nutrition has been improved, it may take 9 to 12 months for new feathering and a new beak to grow. High levels of methionine can be found in sesame seeds, Brazil nuts, fish, meats, and some other plant seeds. Most fruits and vegetables contain very little of it; however, some have significant amounts, such as spinach, potatoes and boiled corn. Most legumes, though high in protein, are also low in methionine. Like a fingernail, damage to the beak leaves it bruised and discolored. Similarly, a fungal infection of a toenail can be seen through the translucent nail tissue and may also cause the keratin to change color or texture. The same holds true for horn-colored beaks. It is possible to view underlying infections or damage. Black beaks are much more difficult to assess, but textural changes are often visible. So if a bird's beak has been bitten or punctured by another bird, or the bird injured its beak after flying into a window or mirror, it is possible to see bruises in the beak's deeper tissue. ... may be a sign of an ongoing inflammatory process, maybe necrosis within the damaged area. Chances are that the affected area is causing significant discomfort or even pain, which can prevent a pet bird from eating, as it may be painful for him to do so. Any infectious process in the beak area can be challenging to diagnose as attempting to procure a biopsy or culture from the affected area is difficult, and may cause more tissue damage. But it is important to try to ascertain what kinds of organisms are likely involved, as treatment for bacteria and fungi require different types of medication. Sometimes blood tests, especially the complete blood count (CBC) and radiographs may help in diagnosing the extent of the problem. The maxilla (upper beak) tip is the most common site of overgrowth. Uneven beak wear is often noticeable, especially along the occlusal or biting surfaces of the upper and lower beaks, usually occurring on both surfaces. Liver disease - often the case with birds that have been on a seed-only diet for a long time resulting in a condition called "Hepatic Lipidosis" aka Fatty Liver Disease. This disease may result in soft areas around the beak and abnormal beak development, including overgrown beaks. Some birds also have overgrown nails / claws (that appear to grow faster than normal). Lack of minerals / natural grooming aids: Providing sufficient cuttlebone or mineral blocks in your pet's cage will help your pet groom his or her beak naturally, usually preventing it from overgrowing. However, there have been concerns about mercury contamination with cuttlebones, which should be kept in mind. Excellent "beak conditioners" are lava rocks that are either suspended on chains or can be attached to cage bars. Cement and sandy perches are also effective for beak wiping and for keeping the beak groomed and should be cleaned often to prevent bacterial infection. Pet stores sell a range of beak conditioning products The above will help keep new growth under control, and will keep the beak healthy and in good form. It is also recommend to provide a variety of chew toys (typically wood) and natural bird-safe branches for your bird to chew on. When a beak overgrows (usually the upper beak), regular beak trimming may be necessary - until the cause is resolved. Treatment consists of trimming the beak to the proper shape and removing any excessive flaking. Beak trimming should be performed by a veterinarian or someone who has been trained in this procedure. If a beak is trimmed too short, it will cause the bird pain, will bleed, and may make it difficult or impossible for a bird to eat. 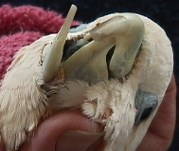 Beak trimming may be performed using manual tools, such as human fingernail clippers and nail files, or side-cutting wire cutters. Some veterinarians prefer using a Dremel drill grinding stone. This procedure generally does not require anesthetizing the bird. Beaks usually grow pretty fast, but in their natural habitat these parrots spend a good amount of time chewing on branches as they forage for food or customize their roosting / nesting place. Captive birds may not have sufficient opportunities for chewing, requiring their beaks to be professionally trimmed. However, feeding a couple of almonds a day and offering fresh branches for chewing will also help keep their beaks trimmed and are far more comfortable for captive birds. Birds may also use grooming perches to keep their beaks in shape. Malnutrition: Deficiencies in Biotin can result in skeletal and beak deformities. Nutritional Deficiencies: Many beak deformities are caused by simple nutritional deficiencies. The most common are methionine, sulpha, biotin (a vitamin) and calcium. Without enough of these the beak material doesn't form properly and tends to bend rather than wear properly. All of these are common deficiencies in the typical diets fed to cage and aviary birds around the world. The problem is easily solved by supplementing with a good quality supplement, such as "Daily Essentials3 and CalciBoost". Remember that the 'new' beak material will take 9-12 months to reach the 'wearing zone' so some beak trimming may be required in the meantime. Exposure to toxic chemicals has been shown to cause beak deformities in several species of birds. The second possible cause of beak deformities, mutation of a critical developmental gene, also has some support in the scientific literature. Changes such as albinism and reduced beak height occurred more commonly in Barn Swallows (Hirundo rustica) near the radioactively contaminated Chernobyl reactor (Muller and Mousseau 2001). Injuries / Infections: Finally, it is clear that injuries or infections can profoundly influence beak development. Gartrell et al. 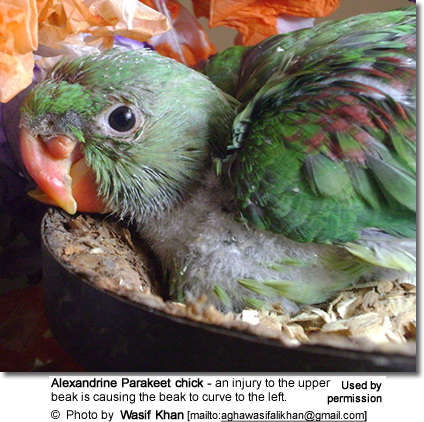 (2003) reported that a bacterial sinus infection was the cause of a beak deformity in an Antipodes Island Parakeet (Cyanoramphus unicolor) chick. Trauma has also been reported as a cause of beak deformities in other caged birds (Flammer and Clubb 1994). Given that normal beak development and growth is dependent upon contact between the tips of the lower and upper beak (mandible and maxilla), it is obvious that injuries to the tip of either the lower or upper beak could result in a beak deformity. Incorrect Handfeeding Techniques: Too much pressure of the feeding implement against the chick's beak may result in beak deformities, as does applying too much pressure when wiping the beak.